Târgu Jiu (also spelled Tîrgu Jiu) is the capital of Gorj County, Oltenia, Romania. It is found on the shores of the Jiu River. It has a population of 101,562 people as of the year 2002. ↑ "Recensamantul populatiei si Locuintelor 2011" (PDF) (in Romanian). INSSE. February 2, 2012. Retrieved March 8, 2012. 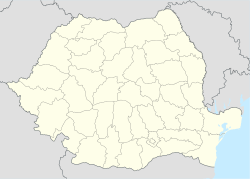 Wikimedia Commons has media related to Târgu Jiu. This page was last changed on 18 May 2018, at 01:53.